The topic I wrote about is entitled “Are contract changes negotiated via e-mail included in the contract? 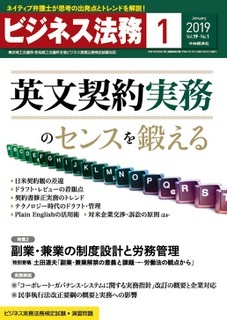 Contract modification trends in practice and points to keep in mind” 「メールでの変更交渉は契約内容に含まれるか、契約書修正実務のトレンドと留意点」My perspective is written from my experience of working in-house for many years negotiating lots of contracts with counterparties over email, before the actual paper contract makes an appearance. I welcome your feedback and comments on this subject/the article!